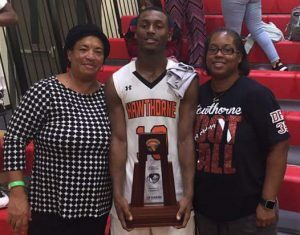 Home / Education / With Half A School Year Left, Will Hawthorne’s Only High School Make the Grade or Close? 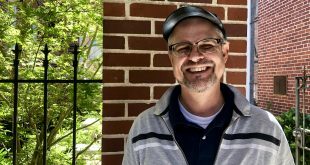 Editor’s note: This is the first in a planned series of WUFT News stories about the future of Hawthorne Middle/High School. We plan to continue covering the impact of the new state law on the school, its students, and the town during 2018. You can see the slogan #AllIn in many spots in Hawthorne, from the walls of Hawthorne Middle/High School, to the PTA website, to the sign beckoning students into the schools. Mostly, it’s in the minds of the people dedicated to keeping the school open past the end of this school year. Once the school in May earned a D rating on the state accountability report, school officials chose the option to try one last time to improve its score to a C. Another D or worse, and the school closes. Some of the school’s stakeholders have united this year to ensure a central part of the rural community stays open to save jobs and keep their children together. With House Bill 7069’s passage into law this summer, public schools in Florida must now earn passing grades or face closure or new management. After the bill became law, school officials hosted a town hall to decide what to do about its poor score. Hawthorne decisionmakers had three options: close for the 2018-2019 school year, transition to a charter school, or an outside provider would run the school. “We selected the closure option to have control over the school,” Mayor Matt Surrency said. With that choice came added pressure, Surrency said, because Hawthorne Middle High is the town’s top employer and center of life for many. “If we are going to develop as a community, businesses here need to know the local labor and workforce is going to be skilled,” Surrency said. The school’s closing would cause an even bigger problem in trying to attract employers, he said. In this way, the months between now and the release of the next state accountability report could determine the town’s long-term future. “We put all our eggs in one basket,” Surrency said. His son Jacob attends the high school. Pulling a cliche from his time as the school’s baseball coach, he’s tried to rally the community. “You want the team together to come all in,” he said. Strong vocational programs are key to a rural school’s success. 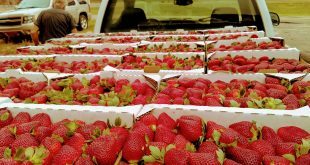 To that end, Hawthorne reintroduced its agricultural education program. 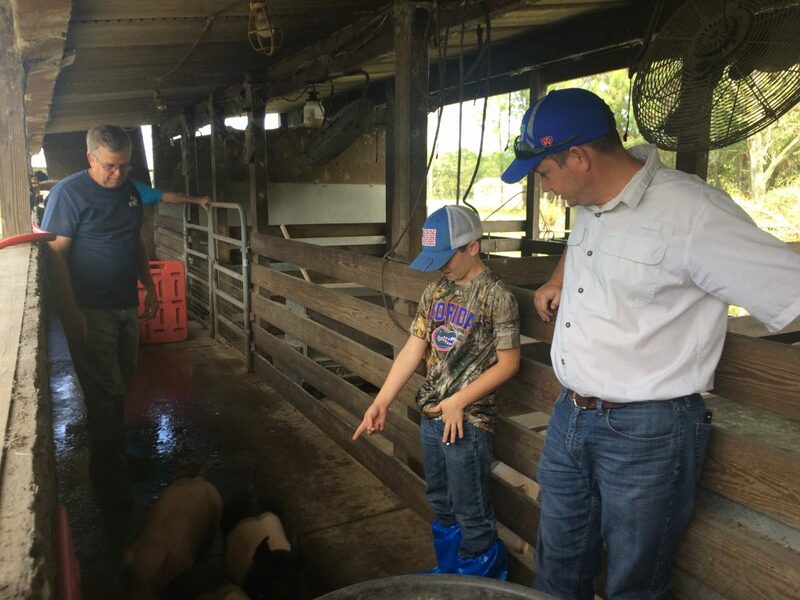 So far, it’s assisted 24 students to raise livestock to present at the Alachua County Fair. Jacob Surrency’s heifer named “Willy” was among the livestock at the fair. In total, there are 160 kids from the school involved in agricultural programs. “These programs will bring students who are motivated to be at school, besides just learning math or science,” the mayor said. Jacob, middle, and Matt Surrency, right, at a local stable. Other efforts have included collecting school supplies to mentoring students after school. One of Lawrence’s children graduated from there. Two more currently attend. She herself graduated from there in 1992. Her mother went there, too. That’s the kind of inter-generational impact the school makes. “When they first started talking maybe about the school having to close, a couple of us got on Facebook and talked about what we’ve accomplished since (graduating),” Lawrence said. When Lawrence was a student, she and her peers had more options, whether they be more challenging courses or vocational classes. She sent her children to Howard W. Bishop for middle school because of the prestige its magnet program offers. A magnet program could increase the attendance at Hawthorne, Lawrence said, and make it a more desirable choice for parents looking to see their children succeed. To help, former teachers have come out of retirement to help mentor students, and a full-time truancy officer is now present at the school. There’s also a new principal: Daniel Ferguson. 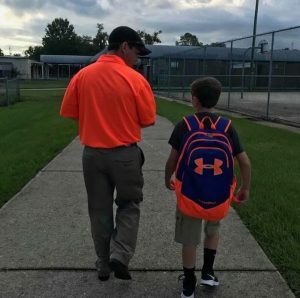 He implemented a more individualized approach to education by encouraging students to increase their “PR” (personal record) and making sure the students who need more help find a mentor. This work can be in seen in the improvement of the schools’ improved assessment grade of “C” in October based on testing administered by the school to monitor the success of the new programs on the students. 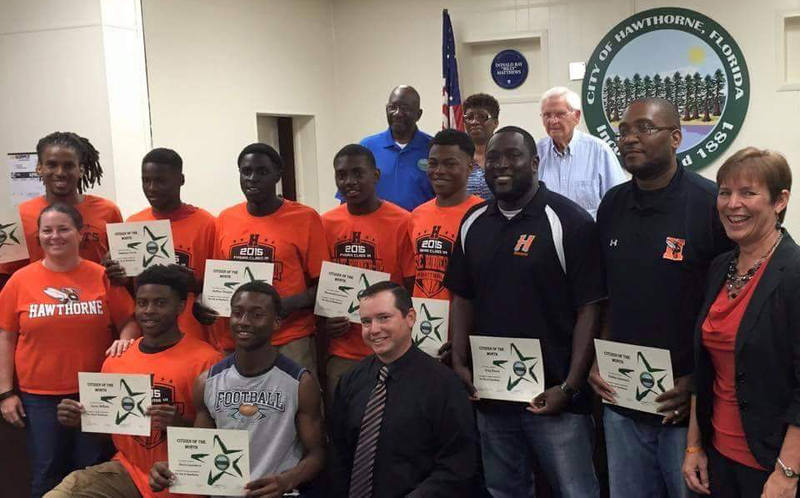 While the results displayed a need for work in subjects like math and language arts, the students received the highest social studies scores in the entire county, Ferguson said. “If they can keep the momentum, they will do well on the state assessment,” Ferguson said. 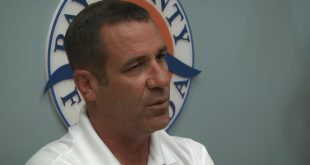 He said the tenuous circumstances has increased the school district’s support, pointing in particular to a $90,000 contract it signed in October with the University of Florida Lastinger Center for Learning. Valerie Brown, strategic partnerships manager for the Lastinger Center, said the partnership has fostered a collaborative learning approach, with students guiding each other through assignments instead of relying solely on a teacher. The Center’s staff hopes to not only see the school’s scores improve to a C grade, but excel beyond that. “One of the hopes of the center is that we will see the same kind of success achieved with Lake Forest Elementary,” Brown said. 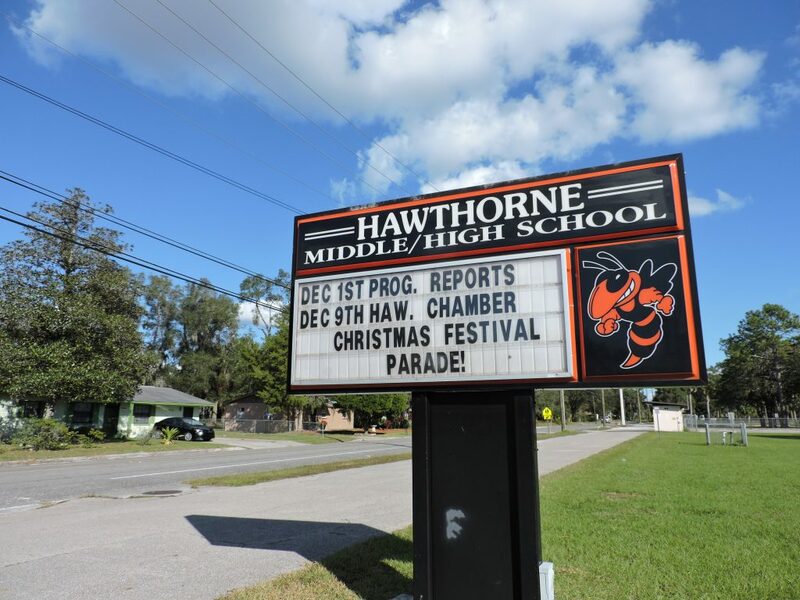 Even at a Mebane Middle School PTSA meeting this year in Alachua — some 30 miles away — one could hear support for Hawthorne, with attendees discussing ways to economically revive the school system’s lagging areas. “Over the past 10 years we have lost nearly $170 million dollars of facilities funding because of cuts made by the state of Florida,” school district spokeswoman Jackie Johnson said. Assuming those cuts continue, solutions need to come from somewhere else. A vote in November 2018 to implement a half-cent sales tax would allow schools to make necessary improvements, Johnson said. District teachers, parents, and administration can suggest renovations through surveys during the next two months; district leadership is particularly interested in renovations that foster creativity and learning. Proposed renovations to Hawthorne include classrooms, the administration wing, gym, agriculture area, re-roofing, safety and security upgrades, and air conditioning. “You have a much better learning environment for students,” Johnson said, but the improvements do hinge on the county voting to pass the sales tax. A number of students, according to Johnson, leave the school each year in favor of opportunity scholarships to attend other schools within the district. With Hawthorne about 15 miles from downtown Gainesville — let alone other areas of the district — it might have a hard time attracting students to a technical program there. Still, it could survive by keeping the students who do live there. Improvements like the agriculture program and hiring of a full-time coach aim to help address a constant problem for rural schools: absenteeism. “There now is a full-time truancy officer at the school,” Johnson said. The district has seen support like never before from those living in Hawthorne, Johnson said. This school year has seen the revival of the Hawthorne PTA and relationship of the town to the school. 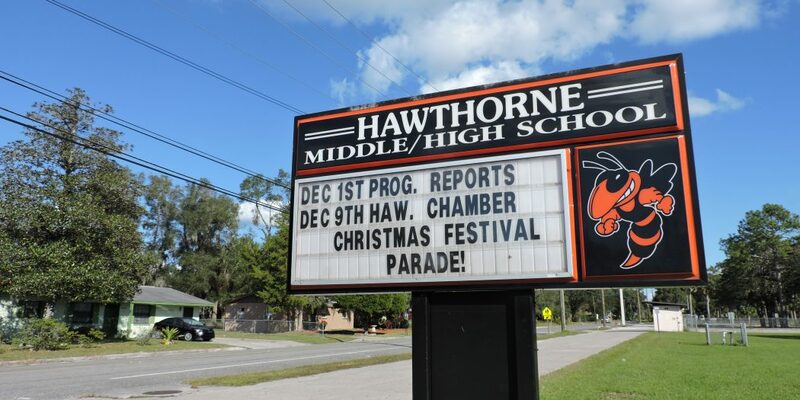 From the school board on down, no one likes the situation the school faces, according to Megan Hendricks, a Hawthorne alumna and vice president of Alachua County Advocates PTA. “I don’t think it’s the right thing for students, teachers and parents,” Hendricks said of a potential forced closing. Hendricks said the student exam is unfair, as students are not allowed to report incorrect questions to their teachers. Hear reporter Bailey LeFever discuss her reporting of this story on this week’s episode of The Point podcast. Khanh-Lien Banko, president of the Alachua County Council of PTAs, said the shift toward test scores is part of a privatization of public education. “There is a correlation between the closing of public schools and the privatization of public education,” Banko said. Under the new law, Hawthorne struggles with a smaller population and larger land area. The critical student group at a larger school that decides whether a school passes or fails would be around 20 or 30 students, Banko said. At Hawthorne, “one or two students can make the difference between an A or a B,”Banko said. The school’s possible closure puts Eastside High School and other recipients of displaced students in a tight spot, possibly forcing the hiring of teachers and the need for more space for students who were elsewhere in May. Still, arguably the biggest difficulty would be those Hawthorne students’ 13-mile bus ride every morning and afternoon. To hear Banko tell it, many of the students opt against dropping out because of the family-like feeling that emanates from a school where the receptionist knows each student’s name. 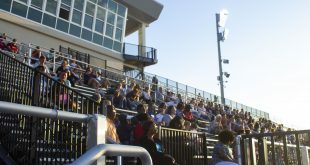 And on a typical autumn Friday night, the entire town comes out for football games, the bleachers full of neighbors and multi-generational families. “The city itself is going to lose,” Banko said. More than anything else, the survival of the school across generations demonstrates the strength of Hawthorne as a community, Patricia Lawrence said, with each degree representing a community’s investment in not only the student’s success, but also the town’s future. Bailey LeFever can be contacted by calling 352-392-6397 or emailing news@wuft.org. Previous Find Out Florida: How Many Parking Citations Does UF Hand Out Annually?